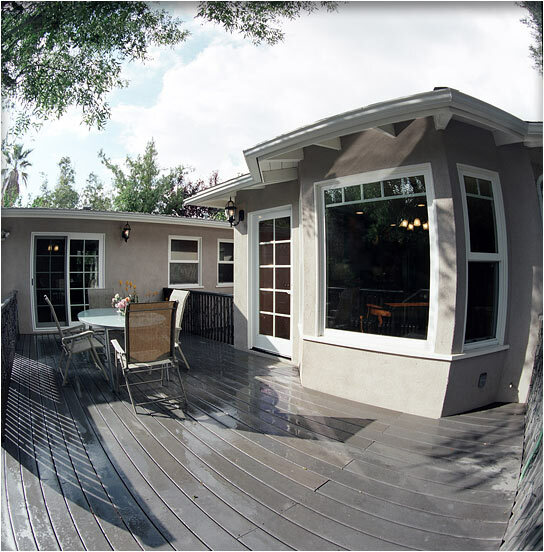 Medium Project 6-1, Tex Deck » Roger Perron Inc.
We solved this owner’s needs by adding on to the kitchen and dining room, which you can see in the foreground of this photo. The dining table looks out to the deck, and the French door has access to the deck from the dining room and kitchen. The extension beyond is a master bedroom addition that we added, which also has access to the newly installed Tex deck. Additions and remodeling of Altadena home, with Bobby Knox, architect, providing construction documents and Roger Perron, design-build contractor.